Family-owned The Wilkinson Baking Company has unveiled The BreadBot – the world’s first fully automated bread making machine – at the recent Consumer Electronics Show 2019 in Las Vegas (CES). The BreadBot turns flour into loaves all on its own, producing bread which is fresh, healthy, preservative-free and eco-friendly in comparison to center aisle bread. The system is aimed at re-establishing an “emotional connection with the shopper” that has been lost in an age of industrial food production. “In the age of home delivery, the BreadBot attracts consumers back to the store. Consumers want fresh, delicious bread that is produced with theatre and engagement,” he says. The BreadBot mixes, forms, proofs, bakes and cools ten loaves of bread per hour – all on its own – and is capable of making most varieties of bread that require dry ingredients. This includes white, wheat, whole wheat, nine grain, sourdough and honey oat. The bread can also be made organic. The BreadBot developers believe that retailers’ bread sales can increase by 30 percent using this fully automated machine. 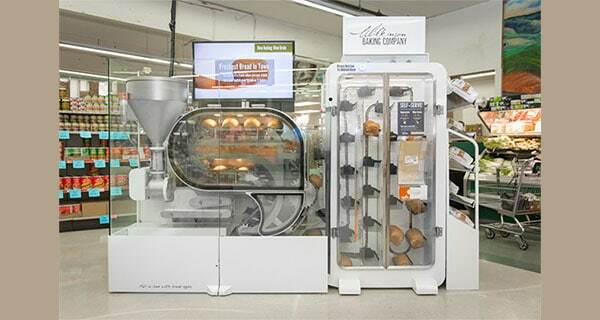 Retailers using The BreadBot can benefit from a potential 20-fold lift in bottom line profit margins through the elimination of the costly current bread distribution process, as well as benefiting from increased consumer interest and maximized employee productivity, the company says. Grocers can get a head start on their daily production demands by scheduling The BreadBot to start baking hours before they open. Additionally, The BreadBot is disrupting commercial baking and helping the environment through the elimination of brick and mortar facilities and distribution overhead, the company also states. “The extended time requirements of the central factory’s model for distribution means that preservatives are added to manufactured bread to ensure greater shelf-life. Production within the grocery store, which the BreadBot enables, serves to eliminate the need for those preservatives,” says Wilkinson. “Excess sugar is also often added to compensate for the loss of bread’s initial aromatic flavours, which diminish in the first 2-4 days. The BreadBot’s preservative-free loaves maintain delicious flavour and avoid the need for excess added sugar,” he says. The Wilkinson Baking Company explains that the BreadBot took 20 years to develop. The major challenge was “mastering the consistent management of a sometimes quirky biological process by a mechanical device,” continues Wilkinson. “Add to that the early lack of sophisticated sensors, actuators and PLCs needed to support our vision for the BreadBot and you’ll understand the time it has taken to complete the project,” the says. Fully developed, the BreadBot contains over 100 sensors to monitor bread quality and bread location. The machine is making constant adjustments on a millisecond basis from mixer speed development of the loaf, forming time and speed, proofer temp, proofer humidity and oven temperatures…..